It's a love story. And instinct. And a wonder. 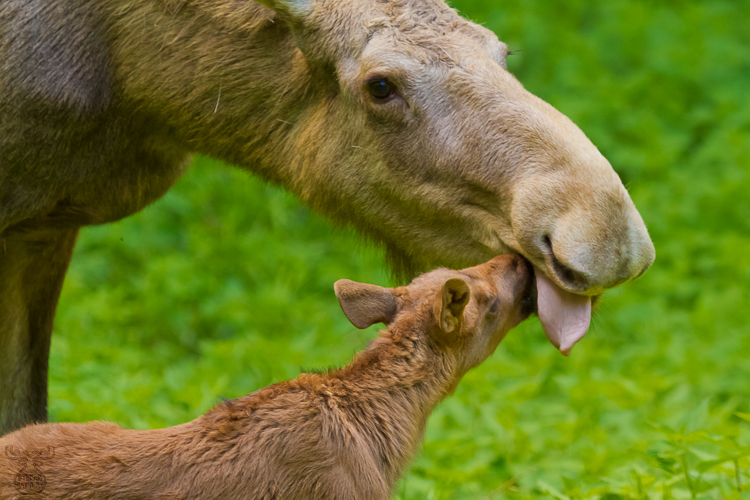 When visiting "Mooselady Lotta" in the nearby wildpark a few days after a cute moose calf had seen the light of the day, the youngster walked besides his mother as if he never had done anything else before. As in wildlife, the moose cow was very protective and started feint attacks whenever someone came too close to the fence. And many gestures showed - translated by human interpretation into human sentimental values - a deep and real love between the mother and her newborn - it was Mother's Day when I visited them taking the pictures. Maybe my objectiveness was clouded by that - I really believed the relationshsip was as intensive as what we call motherly love.